The 17th edition of "Quand les Lesbiennes se Font du Cinema" in Paris was marked by a 10 percent drop in attendance compared to the previous year in 2004. 1,502 women subscribed, with 24 percent of those taking advantage of the possibility of reduced rate subscriptions. 6,342 tickets to see films were sold. We also note that less tickets are being sold in advance of the festival, with advance ticket sales being down by seven percent. Perhaps we did not do enough to explain to festival goers how much time they could save by buying ahead of time to avoid queuing to register and buy tickets. The 168 members who bought a pass ticket giving entrance to all films - down from 180 in 2004 - went to see an average of 13.1 films each, against 12.7 in 2004. Not surprisingly the most popular films on show at the bigger of our two venues, the Trianon, were feature length fiction films: Girl Play, Nachbarinnen and Butterfly. The number of tickets sold was also down in our smaller venue, the Halle Saint-Pierre, even though it was packed out for several of the films: a series of short-length films packaged under the title "Emotions", the "Revenge of the Dykes" programme and another showing of Girl Play. The debates and other events we organised were also a success. In all 68 films from 19 countries were shown. Around 20 directors attended the festival to present their films. The choice of the opening film little man sparked much controversy; A hard-hitting documentary, it broached a very sensitive subject, which some felt was inappropriate for a festive opening gala, with its concert by the group Tribad. Controversy erupted again after a showing of Carole Baillien's monologue, Confessions d'un autre genre (Confessions of another kind). Some of the caricatures portrayed in the film shocked festival goers who considered them to be of a racist nature. A heated discussion followed in the cafeteria, which was duly followed up by the team when taking stock of the festival. While the team stands by its choice of film, it acknowledges that it did not adequately prepare the ground for it. On the financial side the drop in the number of members and ticket sales means that we registered a deficit of 10,000 €, despite the fact that we managed to make cost savings in certain areas. Our spending on venues dropped by six percent, that on the technical side by eleven percent and on advertising and communication by 39 percent. Despite these cost savings, spending increased in other areas, especially programming where the heavy cost of transporting films led to a 39 percent increase in outlay. It also cost us six percent more to print the brochure, which we published in large quantities in order to be able to distribute free to festival goers, bookshops, bars and associations. Profits were also down in the bar, due to an increase in prices by our suppliers which we did not pass on when setting our own prices. And of course the drop off in attendance at the festival had a knock on effect on takings at the bar, and we ended up throwing things like sandwiches and fresh produce away. 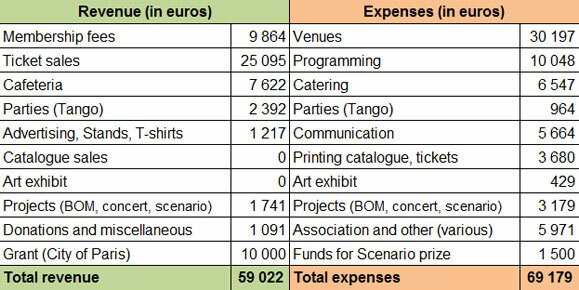 On top of all that the subsidy we receive from the Paris city authorities was cut for the last festival to 10,000 €, from 15,000 € the year before. The subsidy is now only financed by the Observatory on parity issues, after the Cinema Mission withdrew its contribution. We used the subsidy to maintain the reduced tariff policy we established in 2004, to print the brochure, which was given out free, to rent an extra projector, to buy material for our catering, to cover the registration of the directors who attended the festival and to pay the accommodation costs of two team members who attended the London film festival. This time round we did not organise a party as not enough team members were available. But our three Tea Dances held over the year at the Tango were a resounding success.. Attendance at the Ninth Best of Mixte (BOM) Festival, which is open to a mixed audience, was up, with 512 tickets sold over the two days. However our mini-festival continued to be in the red for the third year running due to the heavy cost of renting out material. To limit the festival to four days, October 27-30, given that in 2007 the festival will fall on a long three-day holiday weekend. To strengthen our communications effort, via the web, media and networking with other associations. To renew our application for a subsidy from the Paris city authorities.